Thank you for stopping in to read my #fridayflash. To celebrate NaShoStoMo (National Short Story Month) the Friday Flash Community is hosting a senseless challenge. Each Friday throughout the month of May we’ll tell a story related to one of the five senses; this Friday is taste week. I’m cheating a bit with this one – Hunger has been slightly rewritten so I suppose it can’t be called a true rerun but it was first published in August, 2010; it’s also nonfiction. I hope you’ll forgive the liberties I’m taking with this week’s #fridayflash and, most important, I hope you enjoy Hunger. To celebrate the 4th anniversary of #fridayflash (which astounds me, that we’re going on four years old) there is a Blog Hop going on through the end of the month, so be sure to visit the Friday Flash Community to discover more great flash fiction by outstanding authors and join in the fun! Every nook and cranny sparkled and the only thing left to do was mop the ceiling. So I did. When I was certain all cob webs had been mutilated I took a shower to rid myself of the grime. It was a sweltering ninety-five degrees out, with ninety percent humidity, and I was so big I had to twist every which way just to fit inside the bathroom door. I thought the shower would coax me into taking a nap, but if anything it did the direct opposite. After inspecting the apartment again, (and not being able to find a thing to do), I decided to head out to the garden and pull some weeds. I knew I shouldn’t be out working in such heat, but I had to do something, and no restful activity was cutting it. I donned a pair of Capri’s and a tee-shirt, grabbed my garden gloves, the trowel, and a basket, remembering to put my floppy straw hat on as I walked out the door. As I stepped outside, the phrase “It’s like walking from a refrigerator into an oven” came to mind. Within seconds my face was dripping with sweat. But it felt nice. Even though I’d been miserable for the past three months, I had always welcomed a warm summer with open arms, and I wasn’t about to let my ridiculously large condition ruin that happiness now. I waved to Mr. Edwards across the street as I walked to our garden. He was in his garden too. (He was always in his garden; even if you’d never seen him in his garden, the bounty of his vegetables was all the proof you needed). I shook my flip-flops off at the edge of the pepper row and sunk my toes in the dark dirt. There’s just something about digging your feet in the earth that generates comfort like nothing I’ve ever known. 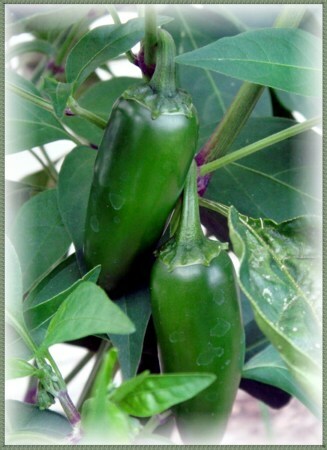 I dropped the basket and trowel and, with great effort, lowered myself to my knees in front of the first jalapeno plant. Although I’d picked every single pepper off this same plant yesterday, it was full to bursting again already. We had given so many jalapenos away people were starting to close their doors and hide when they saw us coming. I pulled several peppers from their stalks. When I reached up to wipe the sweat from my eyes I barely remembered in time that I shouldn’t touch my face with the juice of these hot peppers on my fingers. I swiped above my lips with the back of my hand and tasted dirt. Good, solid, (spicy!) earth. All I wanted at that moment was a giant spoon. But with Mr. Edwards out and about, I didn’t want to look like a weirdo. As I picked more jalapenos, I also shoved a handful or two of dirt into my basket. Back inside the kitchen I filled a large cup with ice water and grabbed a spoon. I placed the peppers in the sink and commenced to eating the dirt as if it would be my last meal, washing each spoonful down with a hefty drink of water. It didn’t strike me as odd that I felt the need to eat dirt. Nothing I did lately struck me as odd. The zest the earth had gathered from the peppers was apparently just what my body needed, though I’d taken my vitamins and eaten quite well; I drank a full gallon of milk every day and ate spinach and pasta like it was going out of style. None of that tasted as good as the dirt. I washed the peppers and stored them in the fridge. I was still hungry for that earth, but my basket was empty and I was too embarrassed to go outside and gather more. And I was tired, finally. I felt like I’d scrubbed ten houses instead of our tiny apartment. I lay down on the couch and was asleep in an instant, not even thinking of the dirt being transferred from my knees and feet to the furniture I’d just scrubbed spotless. I slept as if I’d never slept in my life. Hours later a sharp pain in my abdomen awoke me. I sat up fast and tried to find my breath. It had left me completely alone. This was the heaviest pain I’d ever felt. I wollered around on the couch, trying to find a comfortable position, still looking for my breath. I never found the comfortable position – it hid itself away better than my breath had. I ended up on my hands and knees, rocking back and forth, willing the pain to leave and my lungs to return. My husband opened the front door and froze, one hand still on the doorknob, looking like he might want to turn around and go back to work. The sun pouring through the window shone directly on his face and I focused on his ever-widening blue, blue eyes. He said not a word.